1620: Chris Bevan will be back in the saddle on Tuesday. Thanks for your company today. Hope you enjoyed it as much as I did. I'm heading off to find Cav. 1613: It's been another tough day in the mountains. But there's a welcome rest day tomorrow for the 174 remaining riders. They will journey northwards to Limoges in preparation for Tuesday's 10th stage which will take them 194.5km to Issoudun. 1608: Quick Brit watch. Wiggins and Millar finished in the main bunch, 34 seconds behind Fedrigo. Charles Wegelius was two minutes eight seconds down. And Cav? Hmmm...doesn't appear to have finished yet. There was a lot of hype over him being in the main bunch. He clearly wasn't. 1600: Just reward for Fedrigo in the end. He was one of the original 12 who went clear in the opening five kilometres. 1558: jrmcmish on 606: "Fifth place for Peter Velits. I must have only heard his name three or four times, but last night he kept on popping up in my dream. I woke up not even sure if he was an actual cyclist or if I'd made the name up in my subconscious. I can't remember having dreamt about a cyclist before." BBC Sport's Phil Sheehan on Twitter: "So three stages out of 9 for France in the 2009 tdf. Two for Britain. One for Spain, Switzerland, and Norway. And the TTT to Astana. 1546: All the main general classification contenders finished behind Freire in the main bunch, about 35 seconds behind Fedrigo. That means there's no change in the chase for the yellow jersey. 1543: What a fantastic finish. In the end the peloton couldn't close down and the French crowd went into raptures as Fedrigo came round Pellizotti to cross the line about three-quarters of a bike length in front of the Italian. 1541: Oscar Freire wins the sprint for third place. 1538: Who's going to take the sprint between Fedrigo and Pellizotti. They're working well together. It's a technical closing couple of kilometres which may help the leaders. Columbia come to the front of the peloton. Surely not?! 1535: Into Tarbes. Andy Schlek gets a puncture with 4km to go. Disaster for him. Chase appears to have faltered. 40 seconds lead with 3km to go. 1531: Pellizotti takes a swig from his bottle and climbs out of his seat. But the Caisse d'Epargne team are pushing the peloton on. Fedrigo takes one last gulp, lobs his bottle to the side, retakes the lead and with 5km to go, the lead is 44 seconds. 1529: Italian Pellizotti and Frenchman Fedrigo exchange a word or two - wonder what language? - Pellizotti grits his teeth and puts his head down again. 7km to go. Lead at one minute. 1527: Last 10km. And it's pretty flat. Bit narrow when we get to Tarbes in the final kilometre. Narrow roads and a sharp right with 200m to go spells trouble for the peloton. 1525: Good news for Cav is that Hushovd and Tom Boonen do not appear to be in the peloton. The peloton contains about half of the 174 riders left in the race. A few Liquigas riders near the front of the peloton. Are they going to try and slow it down seeing as how they have Pellizotti out front? 1520: A bit of a spurt from the peloton brings the gap down to under two minutes. Just over 12km to go. From Archie, via text on 81111: "Been away this weekend and the live text on Blackberry has kept me going - hopefully will see last few km." Best hurry up and get home then Archie - 17.5km to go! 1514: Fderigo and Pellizotti working hard up front as they go through Lourdes and the final intermediate sprint of the day. 20km to go and lead remaining constant at two minutes 30 seconds. Caisse D'Epargne heading the chasing bunch. BBC Sport's Phil Sheehan on Twitter: "Sastre has been quiet so far this Tour. When will the eruption occur? Alps stage to Grand Bornand? That's a tough one." GoodPandaPanda on 606: "I don't for one minute buy Armstrong's claims (see 1448) to of been able to follow Contador on Friday. I share a similar belief for the rumour that Cavendish is in the peloton." 1505: Contrasting reports on Cav - some say he's in the main bunch, some say he's adrift. I'll endeavour to find out. I don't have a horizontal GB arrow for moments like this. Rabobank working hard on the front of the peloton and the leaders look they'll be reeled in. They are two minutes 30 seconds clear with 30km to go. Good news for British fans is that Mark Cavendish is in the main bunch. Columbia have a big presence at the front of the peloton as well. Michael Rogers among them, despite his injury (see 1243). Surely not another Cav win and on a mountain stage to boot! 1456: Fedrigo leaps out of his saddle and puts a bit of extra effort in - only to make sure he takes the maximum sprint points though. Not convinced that his Italian companion was up for contesting them though. Neither of the leaders are big threats for the overall lead. Fedrigo is more than 40 minutes down on the yellow jersey while Pellizotti is 15 minutes. 1454: Bit of an interesting development on the road. The group of seven that included Voeckler has given up the chase and is back in the peloton. Pellizotti and Fedrigo's lead has also been cut. They are still three minutes 20 seconds out in front, but they have 35km to negotiate. Will they stay out? 1448: Want more on the Lance Armstrong v Alberto Contador battle? Here's some comments from the seven-time winner on the reason he didn't follow his Astana team-mate when he shot off on the climb up Arcalis on Friday: "I wouldn't say that I could have easily followed (Contador) because it was an impressive attack, but I probably could have gone. But it wouldn't have been correct for me to go across. We'll have more moments, we'll see who's really the strongest. We'll wait, the hardest mountain in France (Mont Ventoux) is on the last day basically so you can't forget that." 1443:Euskaltel's Egoi Martinez will take the polka dot king of the mountain jersey after he picked up 16 points for being seventh over the summit of Tourmalet. 1440: Less than 50km to go. Leading duo are three minutes 30 seconds ahead of chasing seven. Main bunch, which now includes the battered Ten Dam, around five minutes back. Ferdiboy on 606: "Can anyone remember the last time the Tourmalet was a stage finish? It's a legendary climb but all I seem to remember is it being in the middle of a stage, not the end? Why don't the tour use it as a finish as often as the Vonteux or Alpe D'huez for example?" BBC Sport's Phil Sheehan on Twitter: "I rode part of the route this morning - even at 0930 there were people on the roadside cheering me along. I felt great pressure to ride fast." Ten Dam's crash cannot have been too bad - he's back racing and three minutes 25 seconds behind the leaders. Although a I write that, the TV cameras catch up with him. His jersey and shorts are covered in dust and burn marks. He's alternating between squirting water in his mouth and on his bloody elbow as he speeds down the descent. Only 52km to go for the leaders. 1422: Rabobank's Ten Dam has crashed on the descent. 1420: The leaders were two minutes 45 seconds ahead of their pursuers and Pellizotti picked up 40 king of the mountain points for his efforts. Officially 70.5km to Tarbes from the top. Lance Armstrong leads Nocentini in the yellow jersey over the top, some five minutes back. 1416: Here comes the next bunch. Zips are fastened and brakes applied for the first time in hours as they negotiate the first couple of hairpins which have huge drops waiting for those who miscalculate. Garate was third over with Voeckler fourth. 1413: The leading motorcycle parts the crowd to allow Pellizotti and Fedrigo through, but the gap is only a matter of inches wide. And that's it. They're over the top and Pellizotti is first. Fedrigo sits up, takes a deep breath and begins what already looks like the scariest descent ever. 1410: No real change in the lead on the ascent. Pellizotti and Fedrigo maintaining their advantage and if anything, upping it slightly to four minutes 45 seconds over the main bunch. Voigt has been caught by Voeckler's group and they are now just under three minutes back. 71km remaining. Only one on the Tourmalet. BBC Sport's Alex Murray on 606: "This looks like a complete waste of two decent climbs. Really can't see the point in putting potentially decisive climbs in and then placing them so far from the line as to render them pointless. 1405: Metronomic climbing from the leaders - stare firmly fixed on the road ahead, legs pumping. Contrast that to the main bunch. Shirts open, revealing milk-bottle white chests, rolling heads and shoulders, mouths wide open, sucking in the rarified air. 1400: Leaders ploughing through crowds several people deep as they reach the ski resort of La Mongie. Lots of flag waving and an over-excited Aussie or two amid the hundreds of camper vans. Couple of spectators offering 'hands-on' help. And I'm sure I just saw a man dressed in chainmail. Big crowds enjoying the mid-afternoon sun on the Tourmalet. The riders, I imagine, are not enjoying the heat quite as much. Water bottles are being downed quicker than a Saturday night pint on Newcastle Quayside. 1350: Right. Let's get this house in a bit of order. Pellizotti and Fedrigo are about 20 seconds clear of Voigt. There's a group of eight riders which is made up of Van Den Broeck, Paulinho, Ten Dam, Txurruka, Martinez, Voeckler and new boys Juan Manuel Garate and David Moncoutie who are a little over three minutes behind the leaders. Maxime Bouet has leapt clear of the peloton and is just under four minutes adrift, while the main bunch is another 30 seconds back. Got all that? Good. Let's see who's getting over the top first. From Samyool, via text on 81111: "Studying hard for a boring Mba unit at the moment but cannot keep my eyes off the Tour live text feed. What a welcome distraction. Keep it up." 1342: Pellizotti has got a bit bored and decided to make a dash for the summit. Fedrigo decides it's the right move and sets off in pursuit. Voigt plods along. They still have about 10km to the top. How tough is Stage 10 of the Tour? Three of BBC Sport's 'finest' cyclists tackled Le Tourmalet last year. Take a look at the video to see how they got on. 1332: Can't stress for those of you who have never come across this climb before, just how difficult it is. It was first contested in the Tour de France in 1910 and the first man over was France's Octave Lapize, followed by his compatriot Gustave Garrigou. Garrigou was apparently the only man to make it over the top without having to get off his bike. Can't see anyone walking today. thewholehog on 606: "We approach one of the giants du tour (Tourmalet). Literally means 'bad route' apparently, though good to watch if not to race over. Will be interesting to see if Menchov attacks with his Rabobank helpers up the road. This is suiting Astana, to have AG2R doing the pace setting." 1328: Think the riders need the sustenance more than I do though. All I've got to do is keep banging my digits on the keyboard. They have a 17.1km climb up Tourmalet in front of them. 1324: Talking of food, the leaders are hungrily tucking into various bits of grub. Bags have been collected on the move, opened and contents are being stuffed into mouths. Not sure when I'm going to get a sarnie - had a three-hour dash from the north Norfolk coast this morning to make it here, so no time to make my cheese and pickle currant teacakes. 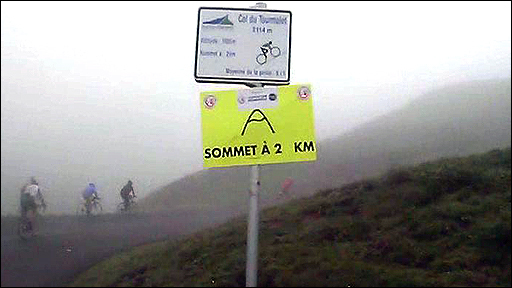 From Scunny Iron, via text on 81111: "Just had lunch 6km from the top of Le Tourmalet! Long drive home tonight! Is today going to be the day? Is today going to be the day for what Scunny? 1317: WHHHEEEEEEEEE!! as my little one screams every time I go down a hill. This one is a little trickier than anything north London has to offer though. 1314: Fifth place at the summit for Martinez is not enough to put him in the virtual polka dot shirt. But the eight points he picked up for being fifth over, puts him within touching distance current incumbent Christophe Kern. Martinez sprints, yep, sprints over the summit of Col d'Aspin in a bid to secure some crucial king of the mountain points. Breakaway leaders Pellizotti, Fedrigo and Voigt had already gone over in that order. The fourth place went to Duque who manfully made it over the top. Around 100km and the small matter of Tourmalet to go. 1306: Hairpins galore as the riders snake up the first climb of the day. Would appear as though Goubert is not in the chasing pack as he is alongside his AG2R team-mate Rinaldo Nocentini, who, let's not forget is race leader. Thomas Voeckler, who memorably took Wednesday's stage, has unzipped his top and blasted out the peloton to join Txurruka et al. 1302: Leading trio of Voigt, Pellizotti and Fedrigo are 55 seconds ahead of Duque, three and a half minutes clear of the second chasing bunch and another 15 seconds clear of the main bunch. Less than 2km to the top of the Col d'Aspin. 1256: Summit of first climb approaching and Duque drops off the front four. Katusha's Vladimir Karpets has bridged the 200m or so gap between peloton and second group. Few riders dropping off the back of the peloton including green jersey owner Thor Hushovd and the man hoping to take it off him, Mark Cavendish. 1253: Ten Dam and Txurruka have made the split and four other riders have joined them. Lotto's Jurgen Van Den Broeck is among them. Astana's Sergio Paulinho, AG2R's Stephane Goubert and Euskaltel's Egoi Martinez make up the six. 1247: Rabobank's Laurens Ten Dam has a dig and so does Txurruka off the front of the peloton which is stringing out a bit. No huge surprise I guess. It's a 12.4km slog up to the summit. That's getting on for eight miles in British money. As the riders make their way up the Col d'Aspin, news from Columbia rider Michael Rogers. The Australian may be forced to pull out. He crashed on Thursday's rain-affected stage and has been riding with a swollen disc in his back for the last couple of days. He's already had some work on his back and plans to spend Monday's rest day on the physio's table. Guess that sheds more light on his message on Twitter this morning: "Morning all. Couple of hard climbs today. Hoping I'm going to get through better than the last 2 days." 1237: Voigt, Duque, Pellizotti and Fedrigo are efficiently going about their business. Moved to five minutes in front of the peloton. from anon, via text on 81111: Where does Cancellara's nickname 'Spartacus' come from? I believe it is due to his size - powerfully built. He's also known as Tony Montana - the lead character from the film Scarface, who was played by Al Pacino. Not sure I see the resemblance myself. And remember to put your names on your texts please. Leading quartet extending their lead to more than three minutes as they surge through the first sprint. Duque claims the six points with Fedrigo and Voigt claiming four and two respectively. Just over 115km to go, but the next 50km of that is predominantly upmountain. One person certainly keeping the faith is Cath, Wiggo's wife. Mrs Wiggins is also on Twitter: " Just spotted him, towards front on right hand side, indeed wearing black socks. Go Brad!" Go Brad indeed! Britain's Bradley Wiggins has surprised many with his climbing abilities over the last couple of days and he's looking forward to tomorrow's day off. Bradley Wiggins on Twitter: "Final day in the mountains before the rest day. Keep the faith people, I ain't no Bernard Khol"
1212: Armstrong is back in the bunch, as are the other nine of the initial escapees from early on. So, with a little over 30km completed, we have Saxo Bank's Voigt, Pellizotti from Liquigas, Duque of Cofidis and Fedrigo of BBO building up a one minute lead. L'Alp D'Huez on 606: "The only possible GC change is Astana getting rid of Nocentini, which will be interesting to see, as Armstrong will surely have to concede if the jersey ends up on Contador's back. 1204: A day of attacks people. Voigt and Fedrigo among a group of four trying to go away from the front of the leading 13. And Lance Armstrong stretches his legs and comes off the front of the peloton. Drags the yellow jersey with him. France's Christophe Riblon, who is in the break, is more than three minutes behind race leader and AG2R team-mate Rinaldo Nocentini. 1200: So, no real dangers to the leaders in the general classification, but Euskaltel and Astana pushing the pace in the peloton and not allowing the 13 to get too far in front. Glorious sunshine in the Pyrenees today. Txurruka didn't make it across but Franco Pellizotti did. He joins Stephane Auge, Jens Voigt, Danny Pate, Leonardo Duque, Heinrich Haussler, Christophe Riblon, Benoit Vaugrenard, Daniele Righi, Pierrick Fedrigo, Stijn Devolder, Marcus Fothen and Simon Geschke out front. Peloton keeping them dangling on a string though. Advantage is 17 seconds. SewerSide on 606: "I think Astana will set some pace at the front of the peloton, to try and shake Nocentini and get Alberto Contador in yellow. It'd be nice to see some attacks from the likes of Evans, Sastre & Menchov, to see if Astana rates them as contenders still. Menchov's so far down, he might even be allowed a breakaway!" 1145: Just in case you missed it, 2006 champion Oscar Pereiro pulled out of the race on Saturday, citing severe fatigue. "Since the start of the Tour he didn't have good sensations," said a spokesman for the Spaniard's team, Caisse d'Epargne. "There was no point in continuing, because it wasn't doing any good." We have 174 brave souls left pedalling. 1141: One dropped back to the main bunch fairly quickly, but our old friend from a couple of days ago, Amets Txurruka, is having a little go at bridging the gap. 1139: An early break - a baker's dozen have gone for it in the opening 5km. BBC Sport's Paul R on 606: "Having ridden the Tourmalet in last year's Etape I'll be feeling the sprinters pain as they drop off the back with 20km still to climb! I wonder if Wiggins wouldn't try a make a bid for yellow today? He's shown he can climb reasonably well, but could he attack on a hill and stay out for the rather boring final 50km? If he's not considered a too much of a threat they may let him go..."
1135: Stage nine getting underway. If you want an indication of what the riders think of today's stage, last year's Tour winner Carlos Sastre twittered: "It will be another day of wear. We have 2 ports hard away from finish. After Tourmalet the headwind not benefit those who want to attack." Behavedave on 606: "In old money (today's stage is) one hundred miles and a total of 7,798ft total climbed. Quite a day in any amateur's frame of reference. The riders will be moving out of St Gaudens in the next 15 minutes or so. Probably a good time to remind you that this stage will be pretty dull without your contributions. There's 606 of course, or you can always text on 81111. 1118: Then it's up the Col d'Aspin, the first of only two climbs. It's a category one climb that summits at 1490m. A quick free wheel down the other side to the feeding station, before the ascent of the Tourmalet begins. Once over the top though, there's the mother of all descents into Tarbes, which lies some 1800m below the Col.
Could be an interesting stage in prospect. There's an intermediate sprint around the 40km mark before the day's climbing begins. Could we see Mark Cavendish and the Columbia boys chasing early points to help close the gap on current green jersey holder Thor Hushovd? 1104: Morning all. Welcome to stage nine. It's the final day in the Pyrenees. And what a day in prospect. Only 160.5km long, but it takes in one of the more brutal climbs on the Tour's calendar. 1100 BST: A short stage today, but it does include the legendary Col du Tourmalet.